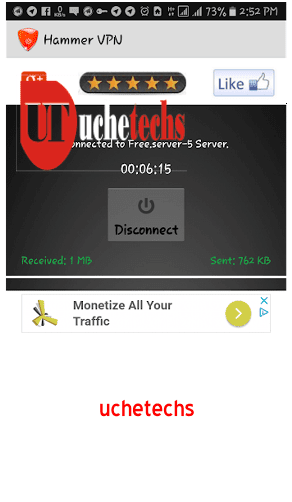 UcheTechs is, here again, we have provided a new and working free browsing cheat on MTN Nigeria. 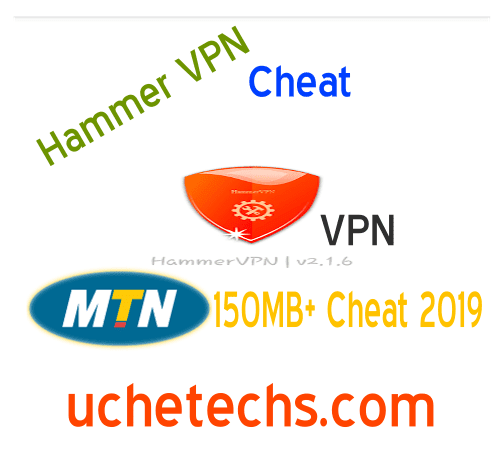 MTN 300MB cheat via Hammer VPN first appeared on our Telegram Group before I decided to share it here. This was meant to be a secret MTN free browsing but something happened, I had to reveal it. Without much talk, let's head to the main topic. Hammer VPN MTN free browsing cheat is capped around 100MB to 300MB daily, better than MTN 50MB Capped. Also, you will be using Hammer VPN Apk which doesn't require any settings nor SSH account. Sad to say, the settings are open to all users, there is no way to lock the settings. So you'll have to follow the tutorial below closely to get yours working properly. Bloggers Note: This MTN Hammer VPN cheat was discovered by UcheTechs, we deserve credits for this, don't post without credits. Some blogger who didn't have enough information about this Hammer VPN MTN cheat says it's 400MB whereas it doesn't reach up to that. It is capped around 100MB+ and you can use your MTN1app 50MB daily to complete your 150MB daily. Hammer VPN has inbuilt servers capped at 300MB and this makes it easy for you not to worry about SSH accounts. Also, Hammer VPN doesn't work in Nigeria unlike now it started working. Currently, I have it installed on my device and i am using my MTN 300MB Cheat daily. Below are the requirements for the MTN Hammer VPN Free browsing February 2019. This is the settings for MTN Free browsing Cheat (150MB - 300MB) Daily via Hammer VPN, your download goes over 700kb/Sec and you can stream, download and browse more than 200MB to 400MB if your sim permits. I have shared this to some and it's capped at 100MB like mine, enjoy while it lasts. Don't forget to share this post on Social media. Cheat Discovered First in UcheTechs Telegram Group by Admins. I am connected but I can't browse with it don't know why help pls? It's saying " This application is not available for use in your country"